Our chapter recognizes the vast importance of documenting the rich and storied past of Japanese Americans in Southern California's San Fernando Valley. Katarou Histories Project, initiated in Summer 2012 as a collaboration between the San Fernando Valley JACL and the PSW JACL, is an on-going public history program that picks up where Telling Our Stories (see below) left off. Katarou Histories is a program designed to engage Nikkei high school youth and adults in the preservation of Japanese American history in the San Fernando Valley through the sharing of personal stories. Katarou means “lets share stories” in Japanese, and this is the primary purpose of Katarou Histories—to tell our stories for our communities across generations. Through a series of interactive sessions, youth and adult participants will gain an understanding of identity and community and the importance of preserving the oral histories of the Japanese American community. As the torch is passed from the nisei and sansei generation to the yonsei and gosei, it becomes even more critical for youth to become invested in the community. Changes being made to our community now will effect these generations and their children for years to come. During workshops the younger participants will have a chance connect with the older generation on a one-on-one level and learn how to preserve stories. For their final project, the participants will have the opportunity to create an oral history video/multimedia project that will connect each individual project onto a larger Japanese American narrative. Further information, including personal essays and poetry, about Katarou Histories Project is available here. Beginning in the early 2000s, Chapter President Nancy Takayama began the process of collecting and archiving valuable historical documents - photographs, oral histories, etc. - that captured the histories of the Issei generation in the San Fernando Valley. Their stories reveal a rich history of building communities and families in the face of harsh adversity. This project was the culmination of the work by members of the chapter, the San Fernando Valley JACC, and the students of Cal State Northridge's Asian American Studies Department, led by Dr. Edith Chen. You can get a snapshot of the Telling Our Stories project at Discover Nikkei. A note about the images: the photograph above is Fred Sakurai and Fred Ishihara in Sun Valley c. 1950 (courtesy of Bill Watanabe). 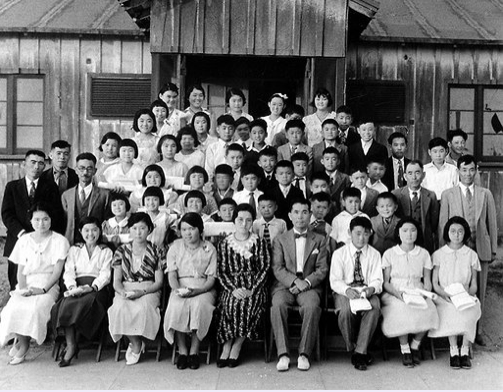 The photograph to the left features students and teachers of the North Hollywood Japanese Language School, 1935 (courtesy of Dr. Bo Sakaguchi).